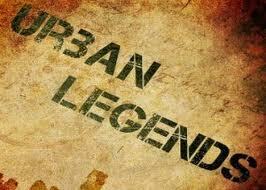 Urban Legends/Myths have always fascinated me. You maybe familiar with some from your childhood. These stories are passed around and repeated so often, it gives them legitimacy. Urban myths can develop in our spiritual lives as well. These myths get passed around among Christians until they are believed to be truth. We quote them so often, we never doubt their accuracy. Let me mention three urban myths about sin. This is called grading yourself against the curve. Back in college, I didn’t mind the teacher grading on a curve when I knew for certain a lot of people made a bad grade. When we compare ourselves to others, especially really, really bad individuals, we grade our sin on a curve. Then it becomes easy to round our goodness up to the next category. Then we wrongly conclude we are one of the good guys and are acceptable to the Lord. This is sinner logic. There have always been evil and wicked people around. Most people appear less evil when compared to them. The truth is “The heart is deceitful above all things, and desperately wicked: who can know it?” (Jeremiah 17:9) This means everyone’s heart is evil and wicked. Why is this urban myth so commonly rehashed today? People recant this myth to justify their own sinfulness. This is once again, sinner logic. The truth is God’s word doesn’t say all sin is the same. We say “all sins are equally the same“, because we know that all sin breaks God’s heart. Now all sin, regardless of the sin, brings us into judgment and leads to hell. But, all sins are not the same. Murder is not the same as lying. A curse word is not the same a worshiping a false god. Some sins bring greater punishment like some types obedience bring greater rewards. What kind of logic is this? Sinner Logic! Always, the best course of action is to quit sinning, repent, and turn things around. When we continue on in known sin, we only make matters worse for ourselves. The longer we stay in sin, the web of deceit gets larger and more difficult to escape. The most miserable people in the world are not non-believers, but instead it is Christians living in known sin. Sin is destructive because it is incredibly progressive in nature. It may begin seemingly inconsequential, but then it grows into a powerful force. Unfortunately, people want to add Christ without subtracting sin. Real spiritual maturity is not just accumulating knowledge, but how obedient we are with the knowledge we are given. The problem for too many believers is we have been educated way beyond our level of obedience.